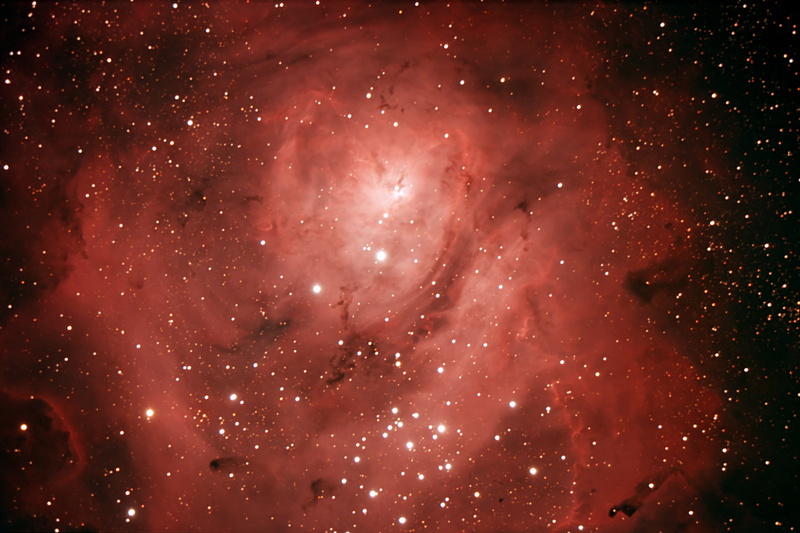 M8 in Sagittarius along with M17 is the visual best of the summer nebulae from the northern hemisphere. M8 is primarily an emission nebula and has many bright and beautiful open star clusters. Visually in moderate aperture telescopes, the central dark dust lane is easily seen and lots of detail of the brighter regions is evident. The nebula is large enough that it easily fills the field of view at moderate magnifications. Photographically the nebula comes to life with much more detail and many Bok globules becoming evident. These are regions of denser gas and dust and are nurseries for protostars being born in this nebula. Exposure Count: 28 @ 5 minutes, 2 hours, 20 minutes total exposure. Last Updated: 11/12/2014 - Copyright © 2004-2013 by Dan Lessmann. All rights reserved. Please click here for my usage policy.